All rules subject to change. As always, the official scorekeeper will be Kristin Cahill (whether or not she's here this year). Once the Septathalon begins, all decisions regarding points, finishes, ties, etc. will be made by her. Before the event, she'll be briefed by Scott Dogg and vinnardo on all rules written here, and some others. Frisbee Golf: This former supplemental event has proved to be very popular with competitors. 14 holes of frisbee golf, using The official MAD FIGS Frisbee Golf Course, not the newer disc golf course. Tie breakers: 1st - Score on 7th hole. 2nd - Score on 14th hole. 3rd - Accuracy competition. 4th - Distance competition. Bowling: Combined total of two games. Easy. Location: Fresno State Student Union. Tie Breakers: 1st - Scores in 7th frame. 2nd - One frame bowl-off (repeated in case of further ties). Miniature Golf: An exhausting round of 18 holes of mini golf. Maxium score for each hole is 10 strokes. Shots that go off the green can be played where they lie for no penalty, or brought back onto the course for a 1 stroke penalty. Balls that are close to a wall can be moved away the width of the black grip tape on the end of the club. Cheating = DQ. The official scorer will carry the pirate flag at all times to make her presence known. Location: The Pirate Course at Blackbeard's. Tie Breakers: 1st - Score on 7th hole. 2nd - Score on 14th hole. 3rd - 14th hole on Fairy course. 4th - 14th hole on Cowboy course. 5th - 7th hole on Fairy course. 6th - 7th hole on Cowboy course. 7th - Love Test Machine. 8th - Dancing Game. 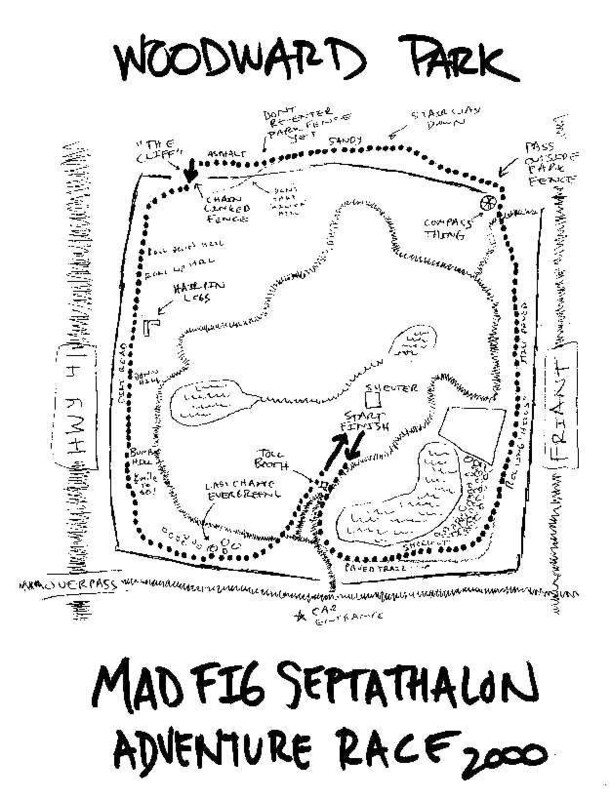 MAD FIGS Adventure Race: A leisurely jog approximately 4 miles in length. Location: Modified Woodward Park perimeter course. Tie Breakers: First person to catch a goose is the winner. Bonus Points: 50 points for running barefoot. Note: Only applies if the competitor is running the race, not walking. No mortal has attempted this feat, and it is strongly discouraged. Ultimate Frisbee: Traditionally there have been 5 games with different randomly-selected teams each round, rankings based on win/loss record. Team sizes depended on total number of participants, but due to low turnout and lack of enthusiasm in recent years the event has been pared back to a single "big game". The Animal will win this. Tie Breakers: 1st - Total points scored. 2nd - Total points scored against (lowest wins). 3rd - "Guts" competition (to 5 points). 4th - 1 on 1 Ultimate (to 3 points). Ping Pong: Run according to Fresno tournament rules (double elimination, no Paul's Rules). The Draw will be preset and RANDOM. The best will rise to the top anyway. Main bracket and semi-final games will always be played to 21. First round and down-bracket games will be to 21 if time permits, or otherwise to 11. Tie Breakers: 1st - Tournament history (if the competitors played each other, whoever won). 2nd - Obstacle ping pong (to 11). The Barefoot Mile: Perhaps the truest Septathalon event. The 'FIGS came together because of running, and hopefully this event will determine the winner. 4 laps, BAREFOOT. Tie Breakers: 1st - 100 meter dash. 2nd - 200 meter dash. 3rd - 400 meter dash. 4th - 800 meter dash. 5th - Battle against The Machine (whoever lives).